Welcome to the Superior Court of California County of Merced Criminal Division. 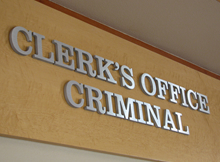 This division has jurisdiction over felonies, misdemeanors, and infractions. Payments are accepted online with a credit card or debit card that have a Visa or MasterCard logo. In addition to payment of your fine amount, a processing fee and convenience fee of 1.99% will be added to your credit/debit card. You can also pay by mail or in person at the courthouse. Please click on the button below to check your case information and use your credit or debit card with our automated online payment system. Note: Should you wish to appear prior to your scheduled date and time, you must report to the Clerk's office prior to your appearance date. Please be aware the superior court is not authorized by law to give legal advice to private individuals. If you are seeking legal advice as to which forms should be filed, you need to contact a private attorney.